How to Break Out of Beginning Kyu Levels (Immediate Results) (すぐに役立つ初級突破法 ASIN: 4140160926) by Ishikura Noboru, 221 pages. This volume of Ishikura's Breakout series grew out of material he presented on NHK's 1999-2000 televised series "Go Time" ("Igo Jikan"). He says that shodan-level players have a fuzzy grasp of the "after fuseki" stage, including but not limited to direction of play issues. To address this weakness, he presents and analyzes 25 fuseki positions selected from a variety of fuseki, at a variety of stages (some are continuations of earlier ones), with or without some josekis already in place, in all of which there is something fairly definite at issue -- perhaps a pincer, an invasion, or a stable joseki from which the player should tenuki and take sente somewhere else. All but one or two of these initial positions --taken from real games--are carried forward by Ishikura 20 to 30 moves into early middle game fighting, occasionally more. (Several positions are identified as coming from unspecified professional games, and at least one is from a game of his own.) The recommended line of play is carefully analyzed from both a strategical and tactical point of view, with many side diagrams showing how to cope with alternative responses or refute bad play. Some of the positions are from handicap games; also, some positions begin right after a mistake has been made in direction of play. In these latter cases, part of the point is to recognize that an error has been made, as well as learn how to take advantage of it. Throughout the commentaries relevant go proverbs are cited, illustrating how they are applied in context. Also, convenient quick check lists are supplied, of rules for handling various situations: how to deny life to an invasion stone, how to respond to a crosscut, how to conduct a running battle, etc. The above description may sound a little bland (my fault) but I found this book to be a must-read: it gathers force from the clarity of presentation and the obvious value of mastering every position analyzed. Each analysis includes tactical nuances which I would have (and have!) fumbled. In addition to the positions where I wouldn't have known how to proceed correctly, there were some embarrassing ones in which I did know how to proceed, except that I was wrong. As usual with Ishikura the book is written to be accessible to a range of kyu players, though this volume, aimed as it is at shodans, is more advanced than the previous one. (I certainly haven't mastered it.) For instance, a number of tactical situations treated at length in OK, How to Break Out of Beginning Kyu Levels, (Practical Part) show up here as lone side diagrams, subordinate to some other issue. (Plenty of new tactical situations are treated, though.) Also many maneuvers studied in the present volume expand to become global in scope, while the preceding volume focused mostly on fairly local play. The first four titles are self explanatory. But even though the positions in the first three chapters come from specific fuseki, the lessons taught there certainly apply to other situations. The fifth chapter gives examples of both reacting to and carrying out reasonable 3-3 point invasions; except that as a kind of dessert, one example is given of killing an unreasonable invasion, along with a reprise of Ishikura's warning that weak spirit is forbidden. All the attacks in the final chapter are ones in which the real goal is enclosing territory or developing outer influence -- always something other than actually capturing the group under attack. Here are some sample diagrams with summaries of the accompanying analysis. The marked White invasion stone is an unreasonable play. How does Black respond? 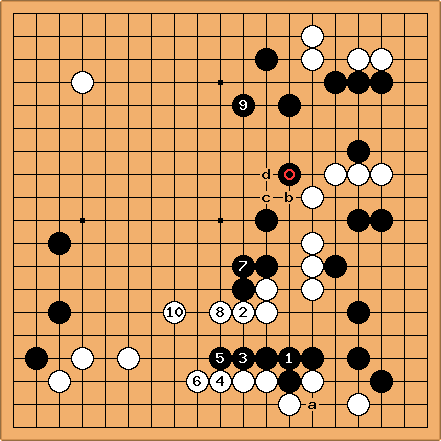 First, capping at the location of will not work -- variations are given to show that at the very least, White will live in seki with sente, gouging out Black's side position and perhaps doing other damage. Instead, the illustrated course is recommended. Side diagrams explain why Black must push with and away from the top position, and why cannot be played, e.g. at a. Note the timing of the leaning move -- playing at b instead lets White link easily with the bottom, ending the attack. Black's moves come from several different directions. After black plays the defensive ; then after Black cuts at a for a bit more territory. Side diagrams explain in detail the timing of Black's choices of direction, what might happen otherwise. The stone is emplaced because of an unplayed fight which might start, eventually, with W b, B c, W d. The marked black stone would be sacrificed, and is in just the right place to prevent Black from being sliced into weak groups. For the sake of kyu level players like myself, Ishikura evaluates the position following the cut at a: Each side has about 40 points of territory, and it has become a territory game; but with the "wonderful" (subarashii) center thickness, Black has the superior game. 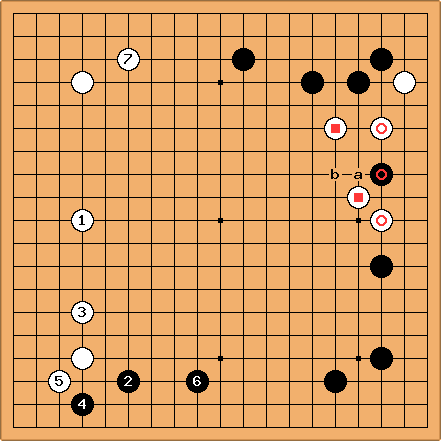 This position arises from an invasion, by the marked black stone, of the marked white third-line 3-space extension. The main line of response discussed in the book just before this diagram differs significantly in there being a white stone at a, in addition to the two white stones marked with squares. But in this variation white, having slid below the black 4-4 stone (also different from before), apparently doesn't want to add another stone to the group. Bad variation, as we learn. Play continues as indicated, with a respectful distance from black's upper right corner strength. "Now is black's chance." Black now pushes at a, and though White blocks at b, an assortment of variation diagrams show that, ultimately, Black cannot be contained -- the more heroically White resists, the more she is cut to pieces in the end. The starting position follows a lengthy discussion of the 3-3 invasion in the lower right corner, with many variations given for the joseki played there. Black has built up a large moyo, but white now has sente, and the timing is perfect for a reducing move. Ishikura discusses why , right on the line joining the marked black stones, is at an ideal spot. How should black respond? He may be tempted to draw back defensively and enclose territory as shown here. But an estimate of the resulting territorial balance shows that, if so, he will have a very difficult game. Instead, he must attack white from the outside starting with , threatening to enclose and capture. The particular sequence is discussed a bit -- is a necessary defensive response to -- but in the end, white cannot be captured; and with the final moves --Ba, Wb, Bc, Wd-- white has escaped and the gouging of black's moyo is complete. However, in the course of the fight black has built up outer thickness, as well as solidifying some territory, and Ishikura concludes that the game is still even. The sample diagrams "Don't enclose" in the review of Sonoda Yuichi's Go Strategy illustrate a similar principle.